Jeremy Popelka helping student Araya Phanprom with some of the fundamentals of glass blowing. It was in this collection of unsolicited and unwanted emails that one message stood out to the longtime owners and operators of Popelka Trenchard Glass, a full working hot glass studio and fine art gallery on Sturgeon Bay’s Second Avenue. 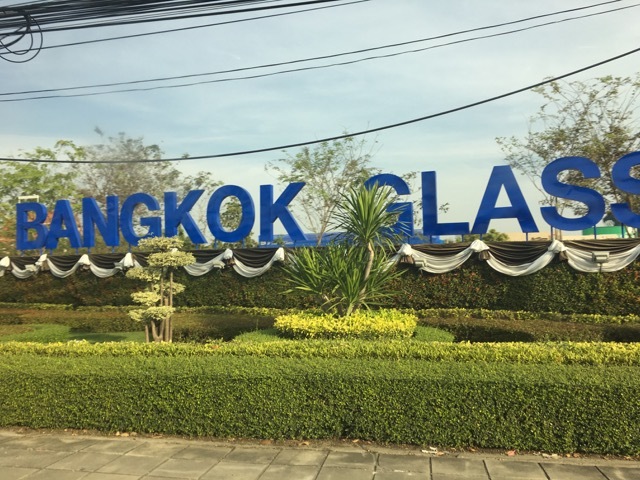 “In a big nutshell, we were contacted through email, in our junk mail, a letter from a very long Thai name saying what is your availability to come and teach, train glass artists in Thailand? To start a glass-blowing studio,” Trenchard explained. While this introductory email alone would have raised red flags for most, Trenchard and Popelka decided to pursue more information from the sender. As it turns out, the man behind the email was a top executive at Bangkok Glass Company, a leader in the manufacture, sale and export of glass and packaging products in Asia and a subsidiary of Boon Rawd Brewery Co., makers of Singha beer. Entrance to the Bangkok Glass Campus which includes a corporate sponsored Soccer Stadium, massive bottle factory, and now the first hot art glass studio in Thailand. 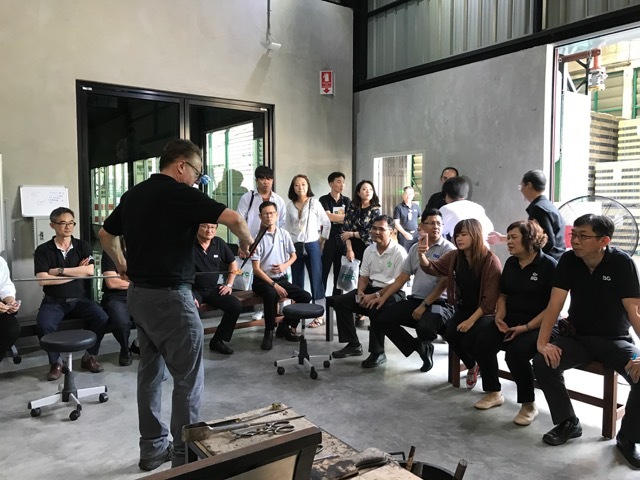 With six manufacturing plants and an ever-expanding line of glass products, the company’s president Pavin Bhirombhakdi and other executives began exploring the possibilities of using their existing space and material to branch out into other glass-making areas. 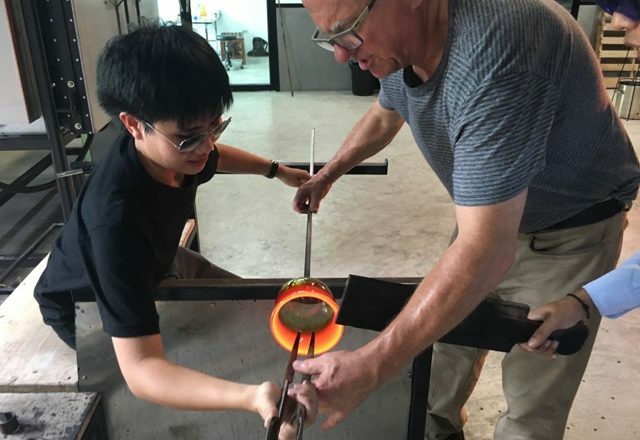 The idea for a hot glass studio – a brand new concept in Thailand – transformed into the idea for Bangkok Glass Studio, the country’s first learning center for art glass. It would offer training courses in glass design and glass forming techniques and with an adjacent gallery, showcase the creative outputs of its teachers, students and employees. While Thailand has a history in glass arts, the idea of a hot glass studio was unprecedented. “There is a long history of glassmaking there but it’s more with torches and melting glass,” Popelka explained. With no immediate connections to the hot glass world, the executives went online, where they discovered a 20-year-old hot glass company on Wisconsin’s Door Peninsula run by a husband and wife team with more than 30 years of experience in the glass arts. If this glass learning center were to become a reality, the company needed artists who understood every aspect of glass and could teach the fundamentals to a group of willing artists. Popelka and Trenchard jumped for the opportunity – a “leap of faith” as they called it – and in January, arrived in Thailand to lead six weeks of classes for a group of Bangkok Glass employees and graduate students from the Faculty of Painting, Sculpture, and Graphic Arts at Silpakorn University in the Taling Chan District. With temperatures consistently above 90 degrees in Bangkok (which translated to a balmy 120 degrees in the glass studio, located within earshot of the clink and clatter of the bottlemaking facility) and a class of students with a limited understanding of English, Popelka and Trenchard relied on visual cues and a chalkboard of translations to teach students the fundamentals of glass blowing and hot studio work along with art concepts and current trends in the art world. Stephanie Trenchard assisting Madammado Tinnaracha in creating a glass catfish the first week of class. “This was spectacular to have young people that were willing to just jump into the process and not be intimidated and to work through different problems. Even though there was a language barrier, you felt a bond with them like you were all in this together, it was a team prospect and nobody was left behind,” Popelka said. 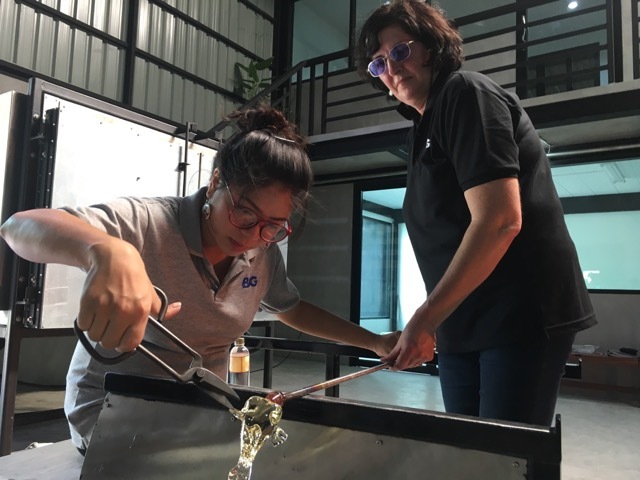 The intensive classes introduced students to the basics of glassblowing while also giving them a hint at something greater. While Popelka took the lead on teaching glass blowing, Trenchard expanded the students’ understanding of glass arts with lessons in more decorative techniques. On Popelka and Trenchard’s behalf, the experience pushed them outside the boundaries of a craft they have long known, introducing them to necessary adaptations in available material and a change in mindset that helped working in the stifling heat of the studio bearable. Jeremy Popelka demonstrates glass making to a group of Bangkok Glass officials and a visiting Korean glass school. Since returning to Door County in early March, Popelka and Trenchard maintain a connection, via Skype, with the remaining artists and will return in a month for the public opening of the Bangkok Glass Studio followed by leading a one-week intensive class. While Popelka and Trenchard prepare for their return to Thailand, they are wasting no time in applying Thai inspirations to their own artwork – Trenchard with Thai pattern and Popelka with Thai architecture and geology, and both with the can-do spirit of the artists, students and company executives they met earlier this year. “It seems a little bit reflective of the Thai culture in that they embrace a fanciful concept and pursue it and do it with really complete faith and it’s going to happen if they pick people and put a lot of trust in you and then it’s just up to you to come through,” Popelka said.